I love a well-made cocktail, but sometimes there's no better way to celebrate Friday evening than with a bottle of bubbly and people you love. Tell me, how are you kicking off the weekend? A night out on the town, or a cozy evening at home? Both sound divine to me! P.S. I wanted to let you all know that Charity, the beautiful bride, amazing friend and true inspiration whose wedding I featured a few months ago, just underwent her second double lung transplant. I hope you'll all send her your thoughts for a speedy recovery! cozy nite in for me. I've been nursing allergies the past few days because the weather here is unaware that we have seasons. Hoping I feel better tomorrow because a nite on the town sounds perfect. Agreed! And I am a sucker for that orange label. Kickin' it off with a company party which I can only assume will include bubbly! Enjoy! My boyfriend is allergic to champagne! I know, right?! It jus means more for me though. :) Happy Friday! So, you know I don't drink but I'm actually going to Happy Hour to indulge in some friend pickles. Yum! Love that photo by the way! i could use a little bubbly tonight to celebrate to a great week... hope you have a great weekend! 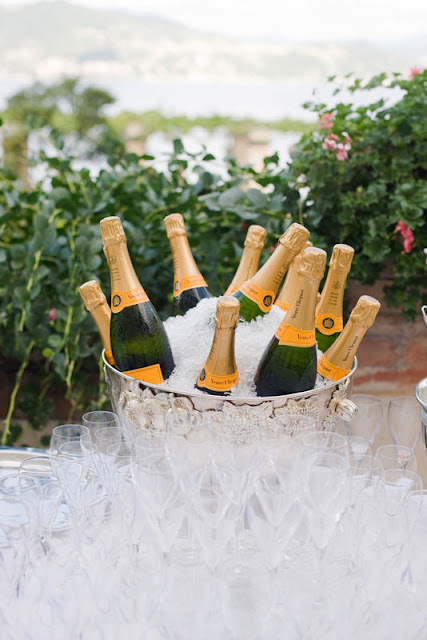 Weekends can only get better when bubbly is involved :-) Have a good one! haven't been able to stop by in forever, but the blog looks fantastic! I'll take a glass... or two or three!! Sending good thoughts her way! Spending the weekend in Palm Springs...hoping for a polo match! Sending lots of positive thoughts!! Enjoy that bubbly! Lena, you are a girl after my own heart. Today is my birthday and this is exactly how I am celebrating it. Have two bottles for the weekend. I need some bubbles in my life right now! Wishing Charity a super speedy recovery!! Oh my goodness, wishing Charity well! Hah, this reminds me of last night! lots of drinks with friends this weekend! i love the new name and layout! sorry ive been away for so long! speaking of drinks... have you seen this site? made me think of you! oh i love your happy photo! Seeing this makes me yearn for the weekend again! Nothing like a glass of champagne or wine to start the weekend. It feels so celebratory. Champagne and Charity... two of my very favorite things in the world. Thank you for the well wishes Lena et all, it means the world to us!